Choosing the appropriate level sensor for your application can be challenging, but Bindicator can help you make the right choice. The more you know about your application, the better aligned your choice of bin level indicator will be. Below is a general set of guidelines and questions you should ask yourself when selecting a level sensor. Point or Continuous level measurement? Point Level: These on/off switch devices are used when you need to know if the material in a vessel has reached a specific point (for example, high level, low level, or refill point). Some examples of point level devices are VRF II, Pulse Point II and Roto-Bin-Dicator. 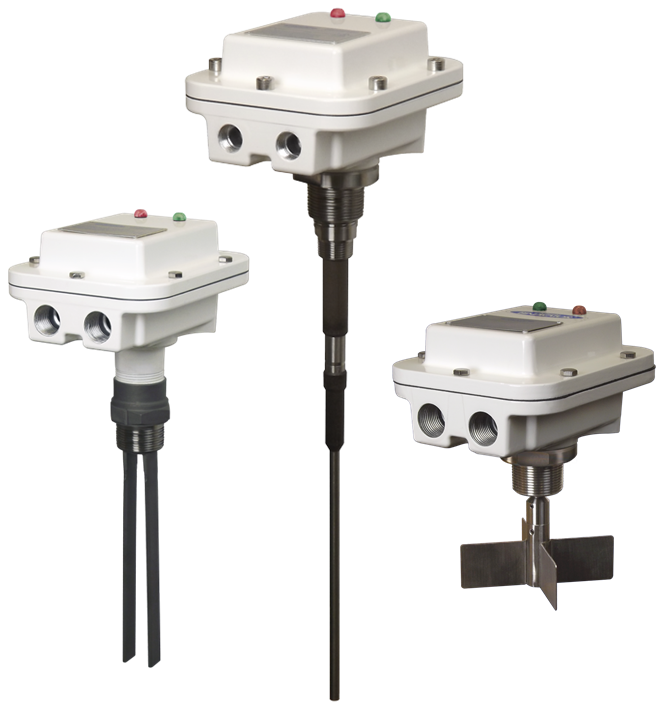 Continuous Level: These sensors monitor the level of material continuously during the filling/emptying process. Options include devices that make contact with the material such as the TDR-2000 and those that do not such as the F78MP Series air radar sensor or an ultrasonic device. What are the properties of the bulk material being measured? Is the material sticky or have a tendency to build up? Bindicator point level devices such as VRF II and Roto-Bin-Dicator can tolerate this and/or alarm you if it is occurring. Or, for continuous level, choose a non-contact device such as the MP Series or the Sono-Tracker ultrasonic. What is the particle size of the material? For larger particle sizes, choose the Roto-Bin-Dicator, VRF II or a non-contact device. What is the bulk density of the material? For very low bulk densities, choose the Pulse Point II. Is it a dusty application? The Bindicator F78MP Series Air Radar device is reliable in dusty environments. Is there any moisture or humidity? Depending on the level of moisture, Roto-Bin-Dicator or VRF II may be appropriate. Is the bulk solid material settled within a liquid? To detect the liquid/solid interface, choose the Pulse Point II or Yo-Yo level sensor. What are the characteristics of the vessel? What are the environmental conditions of the vessel both internally and externally? High temperature? For high temperature applications, Bindicator offers remote electronics or lagging extensions that move the electronics away from the vessel. Hazardous location? For hazardous locations and/or materials, Bindicator offers level sensors with explosion proof or intrinsically safe approvals. Is the vessel thick-walled or double-walled? Bindicator offers pipe extensions to extend the sensing portion of the level device through the dimension of the wall and into the material. Is the vessel a horizontal cylinder, an upright tank or an oddly shaped container? Consider how you will mount the level sensor - horizontally, vertically or at some other angle. Most Bindicator level sensors can be mounted in any orientation. Is there anything that could interfere with a level measurement device? Be aware of items such as vibrators, aerators, internal structure, or other objects that could impede the performance of a level sensor either physically or electronically. While these guidelines are not comprehensive they should give an overall picture that will prove to be helpful. For application assistance, call Bindicator at 1-800-778-9242, or click here to fill out an application data sheet and a Bindicator application engineer will contact you shortly.